I love frills! Frills and embroidery are going to end up covering my entire summer wardrobe, I can just tell! 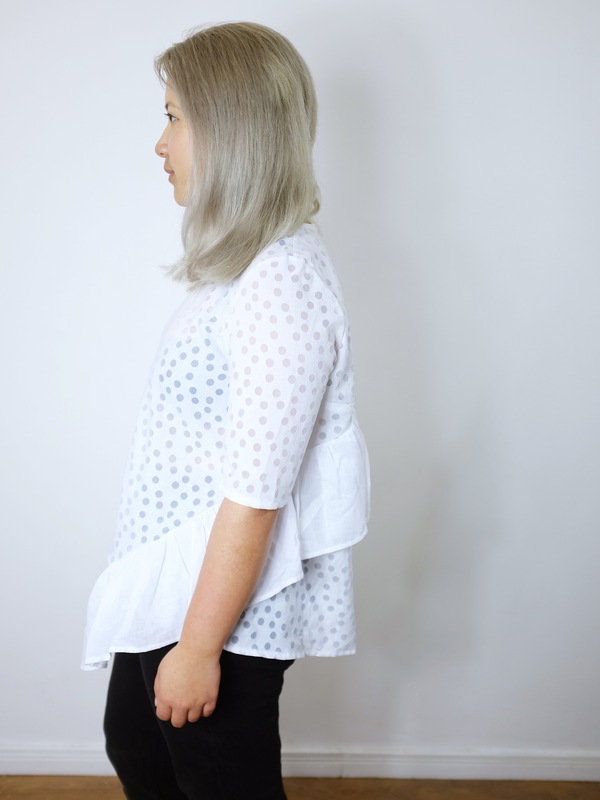 My first of many frilly tops for this summer is the Frill Hem Top from Trend Patterns. I originally wrote about this pattern when I interviewed Lucy from Trend Patterns a couple of weeks ago (you can read that here). I was so excited to get started as I already had the perfect fabric for it! The blouse is designed with huge frill the goes from the front hem up to the back yoke and round again. It creates this gorgeous asymmetric appearance when you look at it in profile. I was interested in the how this top would be constructed as it doesn’t have side seams. It has an angled upper and lower panel which come together to make the body – it’s so clever! The pattern came together really well. There was a moment of confusion where I had the ends of the blouse all mixed up but apart from those very baffling few minutes, it was a pretty straightforward sew. I made a couple of changes to it. 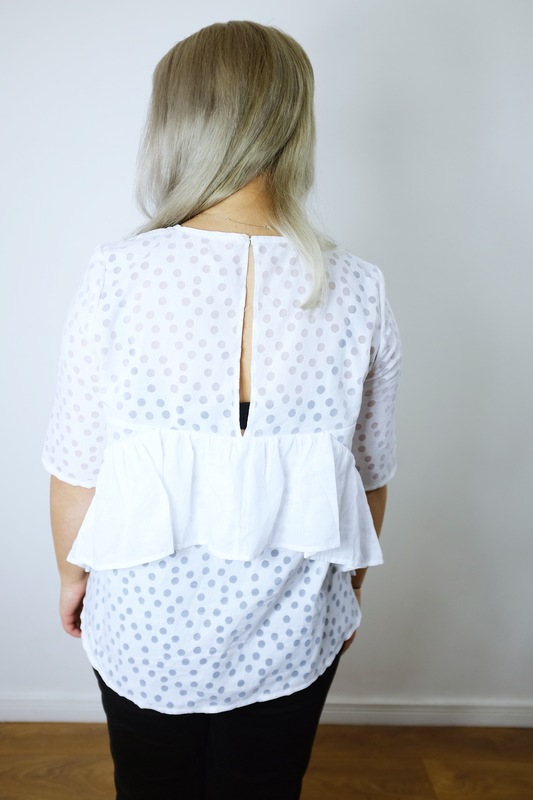 Firstly, I shortened the sleeves to end just above the elbow -it’s a summer top after all! Secondly, I removed the back neck zip. It’s supposed to have an invisible zip in the back yoke but I was concerned that it would look too severe in what was meant to be a fun a playful top. Instead I chose to keep it as a keyhole opening by folding back and topstitching the seam allowance of the centre back seam. I then added a little button and button loop to the very top of the back neck. I also changed the finish of the neck facing to keep it as narrow as possible as it would otherwise be visible through the sheer spots of the fabric. So… I love it. It turned out exactly how I dreamed it would be and that’s always very special when that happens! It’s perfect for this summer, both trend-wise and fabric weight. I think next time (and there will be a next time), I’ll do a big bicep adjustment as it’s slightly tight over the arm to perfect the fit but that’s about it. It looks fantastic, love the big ruffle and it’s great to see something different, the angled seams are fab!! Thank you! I love that it’s different. I think it’s easy to get so caught up making wardrobe “staples” that you can forget to make the fun things too! This is seriously CUTE. I love how the ruffle doesn’t meet at the front? 👏🏻 Good job! I know right?! I love the design of this top! Thanks! Yeah I know, they are VERY pricey. My fabric however was super super cheap – only £2/metre – so that kind of makes up for it!! OMG, this top is absolutely adorable on you! 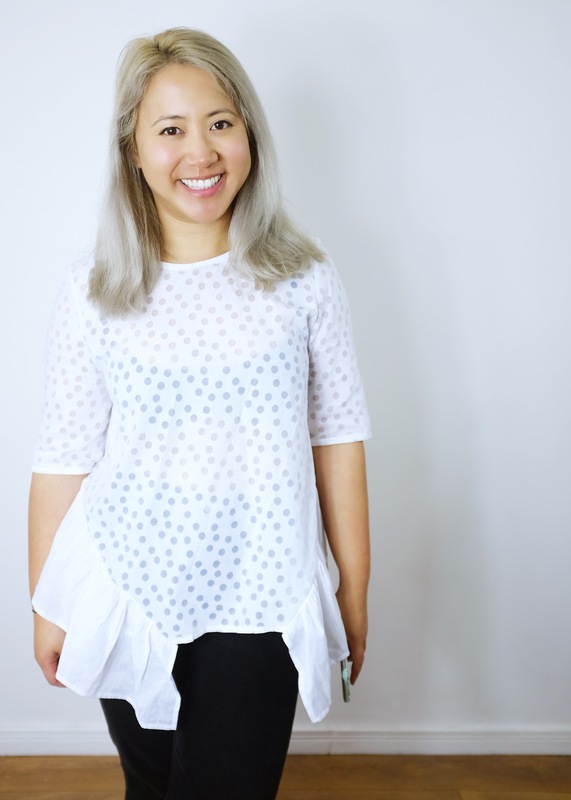 I love your top and I’m so impressed with Trend patterns too 🙂 I have her cape and dress pattern – I haven’t made either yet but I’m looking forward to making both of them. Ooo! I’d love to see those made up!! Both those patterns are awesome!